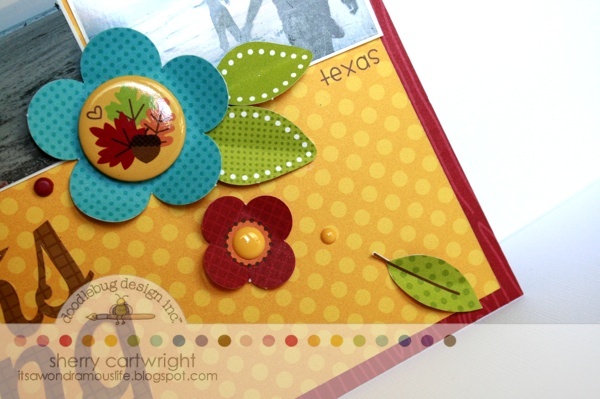 The colors in the new Happy Harvest Collection are rich and full of color and they come together to create the most amazing layouts today on the blog. Don't forget to share, Pin or comment on any of the posts this week to win your own box of Happy Harvest Collection. 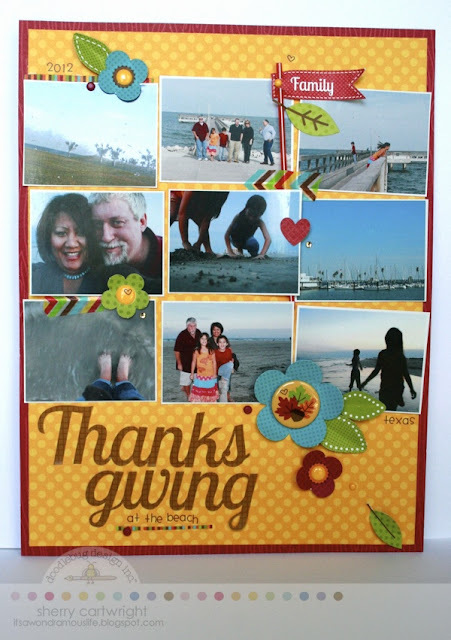 Last year we diverted from our traditional Thanksgiving dinner and had one along the gulfshores of Texas. So fun and fantastic to have a change in pace. Happy Harvest was the perfect color to showcase the photos from out time there. 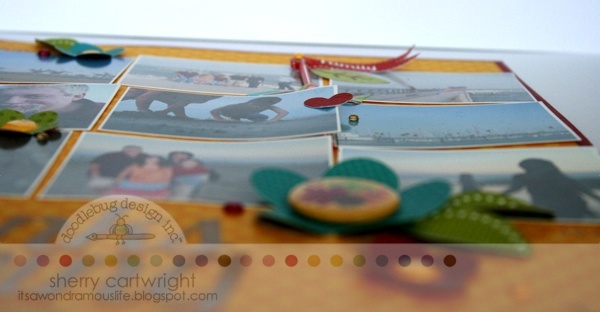 I set the smaller sized photos in a grid pattern, then added bits and pieces of goodness from the happy harvest collection ---- pixie, doodads, flowers, stickers and sprinkles. Cut title sticker in half to make it fit in space on layout. 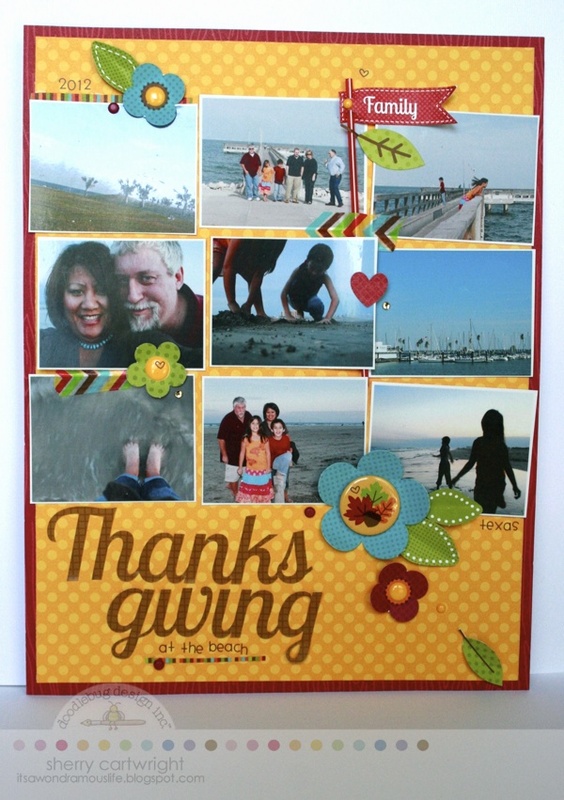 Add family banner sticker from the this & that sticker sheet to a pixie, then tuck under photos to anchor to layout. Use a new doodad as the flower center. Add Doodlebug rub-ons to paper, sprinkles and doodads. Cute! The more I see of this collection, the more determined I am to get it, even tho' I swore not to buy any more papers till I use up some of what I've got. these are amazing -- I have pinned as I want to recreate these for sure. Thanks for the inspiration. 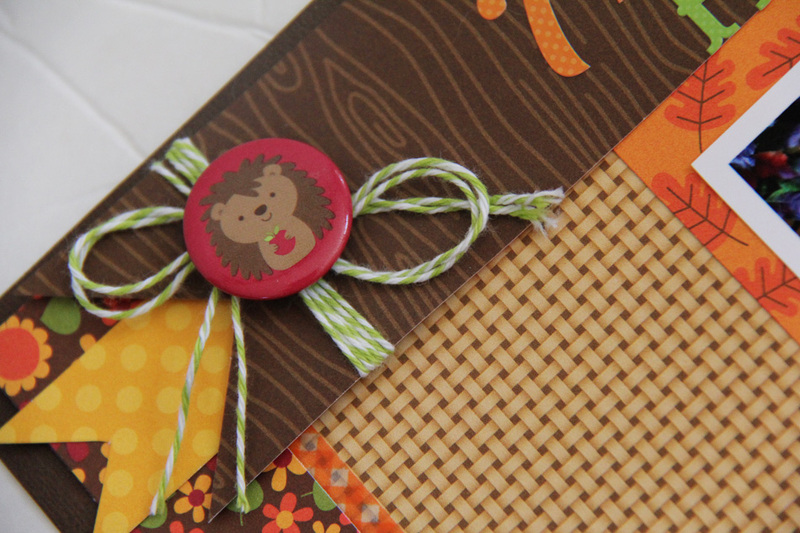 I'm loving the basketweave and woodgrain papers, and all of the little details on these layouts! This is a good collection to make the transition from summer into fall. There are some fun summer colors, and they blend so well with the traditional autumn colors. The little pins in the middle look adorable! I just love the designs. Giving a shout out to my girl Jodi for that gorgeous layout!! 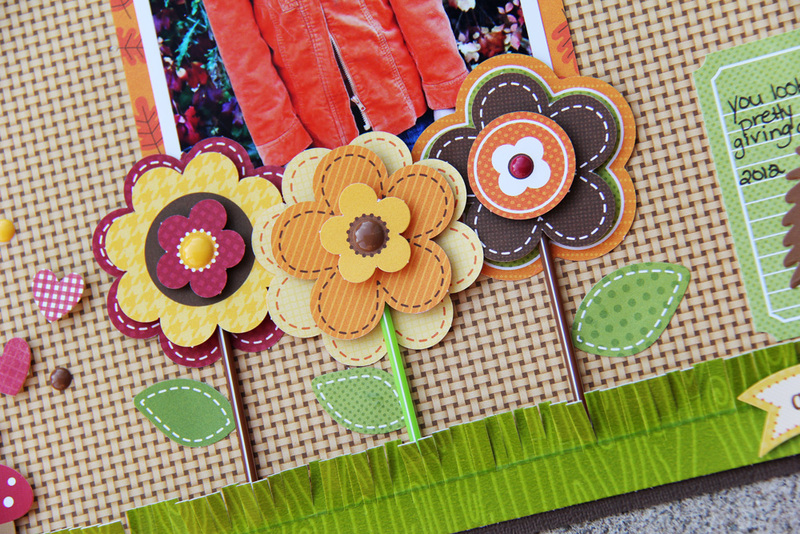 These layouts showcase the Happy Harvest Collection to the hilt!!! I love the paper flowers, the doodads, and the pixies - LOVE the way they were used on these layouts!!! Great layouts. The Happy Harvest collection is so versatile. I can't wait to find it in my lss! Thanks for the chance to win awesome blog candy!!!! I am totally in love with the Happy Harvest collection! I've already got the 6x6 pad and the awesome leaves washi tape. I have no doubt that I'll be adding to my stash, too. Thanks so much for the chance to win! I ♥ Doodlebug! Shared on Facebook & Twitter. It's hard to make a ho-hum layout when using these fabulous papers, great job DT! Great colorful layouts! Love the Happy Harvest collection!! I just love that autumn princess lay out!! Doodlebug is my fav!! I am so so so so so so in love love love love love love!!! I saw this collection in person last night and I have to have EVERY piece of it!!!! And more then just one of many of it!!! Totally - one way or another I will be getting this.....oh the layouts and cards and boxes and altered items and gifts I will be making this fall!!! To say it's beautiful not enough! This one is on my wall too!!! Great layouts! I am ready for fall, and apparently it is ready for me too since Sunday is September! Kudos to the designers of the "Happy Harvest Collection" for bringing together beautiful fall colors into gorgeous patterned papers! I really would love to be the winner of this giveaway, so thanks for the chance to participate! Awesome fall layouts!! I am in love with the new "Happy Harvest" collection for sure!! Thanks for the chance to win..
Love the layouts. They're beautiful. Johanne L.
I love that flair!! So fun and such cute layouts! wow! that floral pattern on the last two layouts really pops! fantastic! Beautiful layouts, I really love the colors in this collection! Love the colors of the new line! The layouts are just stunning with all of the coordinating elements! WOW these layouts are all so beautiful, love all the colors. Super fun layout!! Love how you used the collection on a scrapbook page. 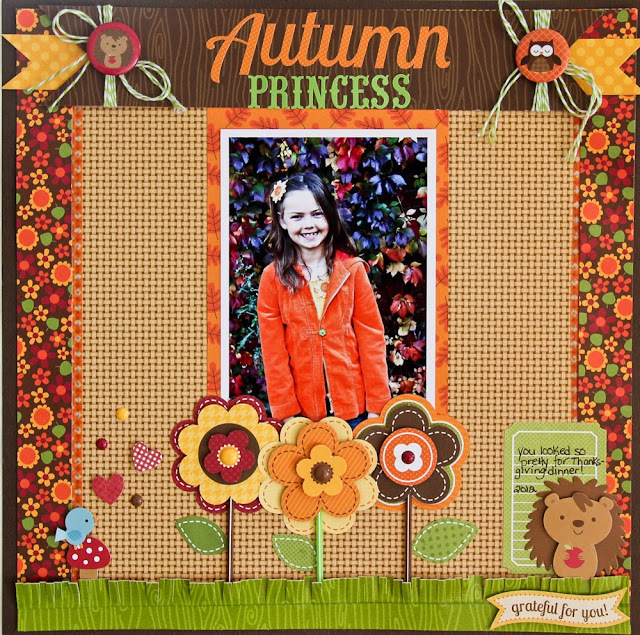 I have been loving all the variety of projects using this cute collection and these layouts are just fabulous! The layouts today really show off the beautiful colors in this collection - thanks for the inspiration! Wonderful LOs......esp love Autumn Princess! These are all fantastic layouts! Fall is the best time of the year and my favorite time to craft. I am madly in love with this entire collection. I cant wait to get my hands on it. The pages on the blog are so wonderful. Thank you for the inspiration. I have enjoyed the projects all week....this Happy Harvest collection is amazing as are the projects made with it. Thanks for the chance to win some.